Mike Bromfield is a Flight Safety Researcher within the Mobility and Transport FRC and a Senior Lecturer in Aerospace in the Department of Mechanical, Aerospace and Automotive Engineering within the Engineering and Computing Faculty. Mike currently divides his time between research, consultancy activities and teaching (aviation safety, flight dynamics, flight test and flight simulation at undergraduate and post-graduate levels). 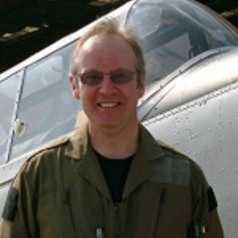 Mike is a Chartered Engineer and a trained flight test engineer. He is a Fellow of The Royal Aeronautical Society and Member of The Society of Flight Test Engineers. He is a private pilot and holds UK and Australian PPL (A) licences. Mike’s current research activities include the investigation of Loss of Control In Flight (LOC-I) encompassing prevention, recognition and recovery strategies. In his work, he makes extensive use of flight dynamics, flight testing and flight simulation/modelling. Prior to joining Coventry University, Mike was awarded a Thomas Gerald Gray Charitable Trust PhD Scholarship in aviation safety at Brunel University. He also became a part-time lecturer in Aerospace. He was active in LOC-I research with particular interests in pilot workload and performance related to aircraft flying qualities. Mike was involved in industry-driven collaborative research into stall/spin accidents. His teaching commitments included contributions to BEng. and MEng./MSc. programmes including aviation safety, flight testing and flight simulation.